The BOMB! simply the bomb! This HitN’Run app has got to be one of the best car racing apps In the world! It’s like Mario Speed cart but smaller, cheaper, and it lives on your iphone. Normally I am not the best at race car games but I found myself flying down their pretty little highway in no time, swerving at first, to avoid the Mac trucks and Sports cars but after a few minuets i was driving like a pro! This is a great stress release app. The art work is mildly flashy, crisp clear picture, exciting scenery and a never ending supply of gas, which you gotta love! The Main Menu has the Options button, a New Game button and a Records button. You can also access the help & Credits menu from here. When you click the New Game button it gives you the option of either a Normal or Advanced Difficulty level. You can also choose the Sprint race option. They have killer music and sound effects. You can choose from Left or Right handed steering options which is great for the left handed geniuses of the world. The iphone vibrates with every collision and bump. You can also measure your distance with either the Imperial system (MLS) or the Metric system (KM). Also it has a Calibration option. Here you can Calibrate your car. I am able to Tilt my iphone perpendicular to gaze. And finally The Records button takes you to the scores board where you can see your Scores and track your progress. You can also choose from a number of other options like the Sprint records, The time trial, the free run, the odometer and Max speed. The highest speed so far is up to 148.94 MPH, you also have the option of checking just the online scores, Friends, Nearby and finally the World’s scores. Talk about getting dialed in, there’s nothing better than a whole community of gamers to get your engines roaring and speeding towards victory! They have awards, a friends you know option and an amazing Profile page that you can customize and share with your friends. Hit N’Run is truley the bomb! I would definitely recommend this app game to anyone who loves the thrill of the race, the vibrations of crash and the feeling of glory that comes from winning! again this ap is a great stress release tool, that i think will come in very ‘handy’ if you know what I mean. Don’t think, just do, on this one! 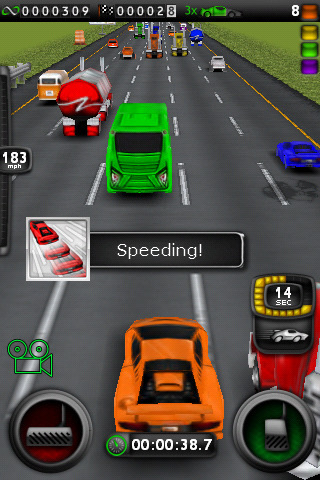 AppSafari review of Hit N’Run was written by Christin Chambers on March 28th, 2010 and categorized under App Store, Fun, Games, Racing. Page viewed 5040 times, 1 so far today. Need help on using these apps? Please read the Help Page.